Sometimes the best ideas are the simplest ideas. For years, cooks who appreciated the merits of both single-basin sinks and double-basin models still were forced to choose between them—assuming they didn't have the kitchen space to install two sinks. It wasn't until 2006 that a U.S. sink manufacturer recruited a product designer to come up with an elegant solution. This solution, called the low-divide or dual-capacity kitchen sink, provides two basins but with a center divider that rises only partway to the top of the basins. This may well be the sink for you. A single-basin sink, as the name indicates, is just one big tub installed within your kitchen counter. It is perfect for washing giant casseroles, turkey pans, baking sheets, as well as for smaller items. But the lack of a second basin means that there is no reserve of fresh water to rinse items. Also, many homeowners like to locate their dish-drying rack in the second basin to allow for water to drain right into the sink drain. No second basin means no sink space for a dish-drying rack. So, the dryer must be located on the countertop, taking up precious countertop space and sometimes making a watery mess. Is the solution to have a sink with two basins? Partially. But in a double-basin sink, the individual basins are smaller—often too small to handle those big baking sheets. 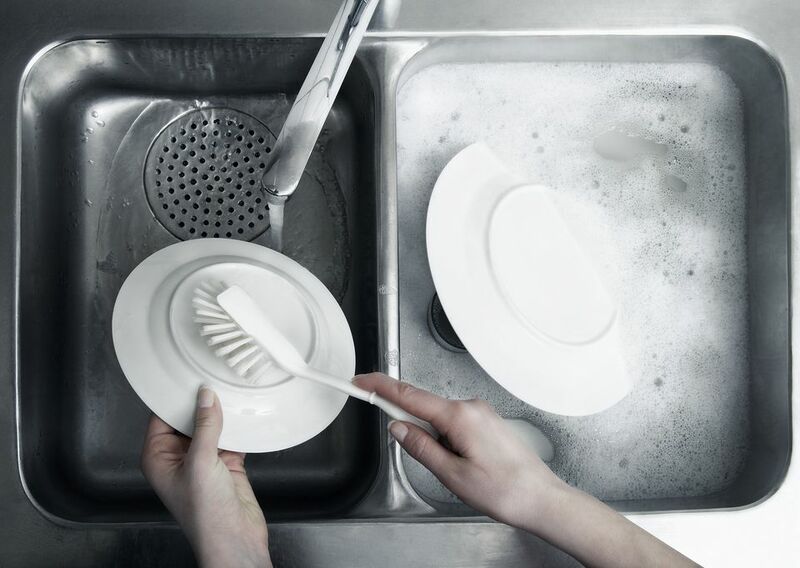 The "washing side" of the sink is much smaller than the baking sheet, the "drying side" may be too small to rack the pan, and the pan may not even fit under the faucet for rinsing. If you're lucky enough to have a hand-held sprayer kitchen faucet, you can spray it—but you may end up with water all over your kitchen countertop and the floor. The other problem with full-rise sink dividers is that it's difficult to fit large pots underneath the faucet: the divider gets in the way. Even though it's now called the Smart Divide Sink, Kohler initially patented the idea in 2006 for what they then called a "dual-capacity sink," meaning that one capacity is double-basin (soapy water in one side, clean in the other, for example) and single-basin (water all throughout). As with most inventions, there are precedents. One early solution was a convertible sink that had a removable divider. But the convertible sink inventors didn't recognize that kitchen sinks get dirty; the grooves on the convertible sinks constantly became clogged with gunk. Kohler felt that it made more sense to create a solid product that had no moving parts and no grooves to cause cleaning problems. So Kohler inventors Tod Babick, William Gordon, and Richard Kuether came up with the Smart Divide. Kohler's plans originally allowed for a divider that was anywhere from 20% to 70% of the height of the outside rim of the sink. In other words, if the basin was 10 inches deep, the divider might be as low as 2 inches or as high as 7 inches. But this proved impractical, because a 2-inch high divider didn't allow for any room to fill up the separate basins, and 7 inches was nearly identical to a standard double-basin sink. When full, the single-basin (what Kohler calls "the Third Zone) was nearly level with the outside rim of the sink. So Kohler designers settled on a divider that rises to 50 to 60 percent of the basin height. Kohler. As mentioned, Kohler developed the low-divide sink carrying the brand-name Smart Divide. It's made of enameled cast iron and comes in four models. Kohler provides the most choices in low-divide sinks, though they are also the most expensive. Elkay. Elkay makes a variety of low-divide sinks in stainless steel and quartz. Swanstone makes a quartz under-mount sink with a low divider. Blanco's Performa Silgranit is that company's low-divide sink. The material is 80% granite. Ruvati makes stainless steel low-divide sinks with a divider this is about 4 inches lower than the full height of the sink. There are both 50-50 sinks (both basins the same width), as well as 60-40 sinks (with one basin occupying 60 percent, the other 40 percent, of the total sink width).